When my son and daughter-in-law announce they are moving to Oak Park, a suburb just outside of Detroit, I am stunned. My daughter-in-law’s job necessitates the move, but their initial plan is to live in Ann Arbor. Who moves to Detroit? While it’s the city of my birth, I haven’t been compelled to visit in many years. As they consider their options, Detroit’s low-cost real estate market and a burgeoning arts scene prove irresistible. My enthusiasm is bolstered when I map out multiple restaurants with James Beard nominated chefs and national acclaim. Because really, how disturbed would I be if was forced to visit a city that didn’t boast at least a few destination-worthy restaurants? I have no reason to fret. Detroit’s rebirth is in full bloom, and a comparison to Brooklyn doesn’t seem far-fetched. Museums, shops, restaurants, and distilleries are booming. Even Comedy Central is in on the resurgence with its quirky television show “Detroiters.” A sub-plot centers around the city’s transformation. (see Season 1, Episode 6, “Third Floor” ) It’s a very funny show, which underscores the fact that it’s time for Detroit to be taken seriously again. Dearborn, just outside of Detroit, has one of the largest Muslim American populations in the country. The authenticity of the restaurants, bakeries, and markets are incomparable. 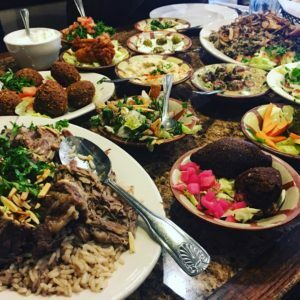 Al Ameer, a Lebanese restaurant, is included in Bill Addison’s list of Eater’sBest Restaurants in America 2016. The restaurant was also honored with a James Beard America’s Classics Award last year. It is mandatory on my to-do list. We are here for lunch, and while the intention is to keep it light, we fill the table to capacity with a mezze combo showcasing crispy falafel, stuffed grape leaves, spicy chicken wings, creamy hummos, freshly made salads, baba ghanoush, and more. We can’t resist augmenting the combo with moujadara- a traditional Lebanese dish of lentils and sauteed onions. And I can’t help but order one of the dishes that has diners flocking to Al Ameer- stuffed lamb(pictured in the photo below, bottom left). The plate is brimming with tender meat, mounds of fragrant rice, and smothered with almonds. Middle East meets Midwest at Al Ameer and it’s all good. 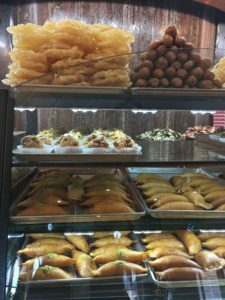 Stuffing your face at Al Ameer should not preclude a visit to Shatila Bakery. One side of the vast café is lined with Middle Eastern pastries, the other is European. We pack a box filled with marvelous baklawa, cookies, and an assortment of sugary pastries that keep us going the entire weekend. Selden Standard, in downtown Detroit, merits the hype. We focus on the appealing “Vegetables & Such” section of the menu. Beets, cauliflower, and brussels sprouts stand out with fresh twists. 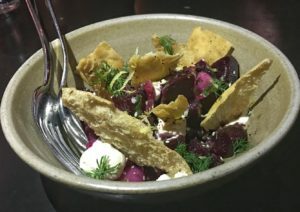 Roasted Beets get their zip from tahini, za’atar crisps, pickled onion, and radish. Cauliflower fritters shine with almond romesco, pickled cauliflower, and lemon. 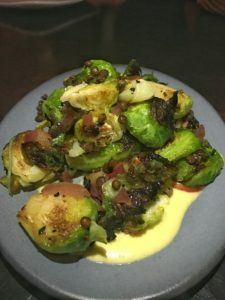 Roasted brussels sprouts have a lively garnish of Meyer lemon, pickled raisins, and crispy lentils. A bright grapefruit and avocado salad is embellished with kohlrabi, fennel, olives, and mint. 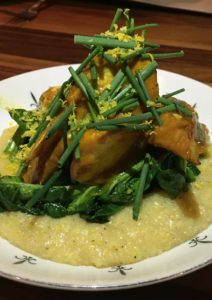 Partner and Executive Chef Andy Hollyday (a three-time James Beard semi-finalist) has a penchant for incorporating assertive jolts of acidity in his dishes, and the end result is anything but standard. A RESTAURANT EMBRACING THE HISTORY OF DETROIT’S INDUSTRIAL REACH. The cinder block building that housed neighborhood fare for decades has received new life to further the tradition of hand-made, thought-out food and beverage. The city of Hazel Park has the history, character and fervor to embrace Mabel Gray as the modern, adventurous restaurant that it is. Mabel Gray was named 2017 Restaurant of the Year by the Detroit Free Press, was proclaimed one of the nation’s Best New Restaurants by Eater National in 2016, and Chef/co-owner James Rigato received Eater Detroit’s award for Chef of the Year last fall. I am usually aware when a restaurant is helmed by a former contestant on “Top Chef.” But I have no recollection of Rigato, who appeared on Season 12 and was the fourth chef to be eliminated. I will absolutely remember him now, though it will be for his food, rather than a persona on a television show. 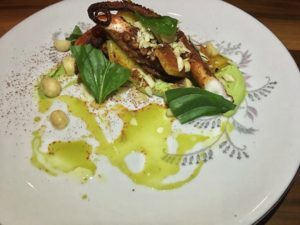 Chef Rigato’s cooking is original, imaginative, and ambitious. Dinner at Mabel Gray ranks high on my list of all-time favorite dining experiences outside of Washington, DC. Dishes have a cross-cultural view. Hamachi crudo is heightened by konbucha vinaigrette, jalapenos, and miso mayo. 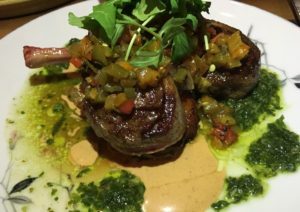 Lamb chops are dressed with chimichurri, marinated sweet peppers, fried sweet potatoes, and smoky crema. Trout is paired with kimchi compressed apples, cabbage, and smoked maple and squash puree. I could go on, but with an eclectic menu that changes daily at the chef’s whim, you will likely find an entirely different set of options if you visit. The star of the show for me was the octopus. It was perfectly cooked, with a nice crunchy char and a combination of sauces delivering a punch of refreshing flavor and heat! I also really liked the trout, with its melt in your mouth meat, crispy skin, and surprising combination of earthy-sweet, smoked maple squash, chewy wild rice, and sour kimchi compressed apples. The mushrooms had deep meaty flavors, which is awesome for a vegetarian! Each dish offered an abundance of texture and flavor in a beautiful, yet simple presentation without putting on any airs. … the food was delicious and approachable without trying too hard. This mirrored the restaurant’s vibe, which was unassuming yet inherently cool. Where Else Did We Eat & Drink? My son and daughter-in-law have fully embraced their new city, regularly regaling me with tales of their dining experiences. I’m ready to book a plane ticket for another visit. With new restaurants to conquer, and a list of favorites where I want to return, I’m wondering how long I can stay. It’s a good thing they have a spare room. I just saw a tweet from Eater Detroit listing 16 hot restaurant openings. Seriously, Detroit! ?